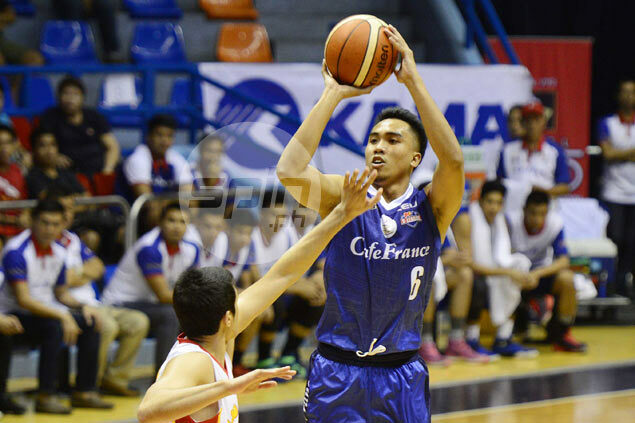 SAMBOY De Leon has slowly but surely found basketball success as one of the stars of Centro Escolar University in the Naascu as well as in the PBA D-League where the school carries the CafeFrance brand. But not many know that it's been a long and winding road to recognition for De Leon. The 24-year-old De Leon started out as part of the Far Eeastern University's Tamaraws basketball program, playing for the school's Team B from 2010 to 2012. But after two years of waiting to crack FEU's main roster, De Leon made the jump to CEU where he has since flourished, even earning the distinction as one of the top players in the developmental league for CafeFrance. The bumpy start notwithstanding, the 6-foot-3 forward has never wavered in his belief that he has what it takes to make it in basketball ever since he started trying out for numerous schools. “Nag-Team B ako sa FEU, 2010 hanggang 2012 tapos umalis na ako. Siguro mas may nakikita akong ibang opportunity sa ibang school. Napaganda pa ‘yung lipat ko,” he added. The Nueva Ecija native said head coach Egay Macaraya has been one of the reasons why his transfer to CEU turned out for the better. “Maganda rin ‘yung exposure sa CEU saka suwerte rin ako napunta ako sa programa ni coach Egay. Ang gusto talaga ni coach Egay, ‘yung makarating kami sa PBA,” he said. De Leon failed to make it to the PBA last year after he was left unsigned by the Star Hotshots, who picked him in the 2015 draft at 39th overall. But Macaraya, De Leon said, has been working on his move to the small forward position, specifically polishing his perimeter game, to enhance his chances of making it to the pro ranks. “’Yun ‘yung pina-practice sa akin ni coach Egay. Dine-develop niya ako sa three position. Pina-practice namin ‘yung outside shooting ko,” said De Leon. De Leon admitted he was left frustrated by his failure to make it to the pro league on his first try, but insisted it only made him more determined to work on his game this season with the Bakers. “Medyo frustrated din kasi as a player, pangarap ko makarating sa PBA. Medyo star-studded din ‘yung Star saka sa puwestuhan, mabibigat,” said de Leon. “Pero nag-move on na ako dun. Challenge na lang sa akin ‘yun para maging better player,” he added. But first, De Leon said he is focused on the task of going for the Aspirants Cup crown against Phoenix Petroleum, which ironically is made up mostly of former teammates at FEU. “Kasabayan ko rin sila Mac (Belo), (Achie) Inigo, (Roger) Pogoy. Malakas sila kasi team rin sila. Buo rin sila, parang sa amin din. Matagal na rin magkakasama,” said De Leon.